founder & chairman ashley furniture industries, inc. 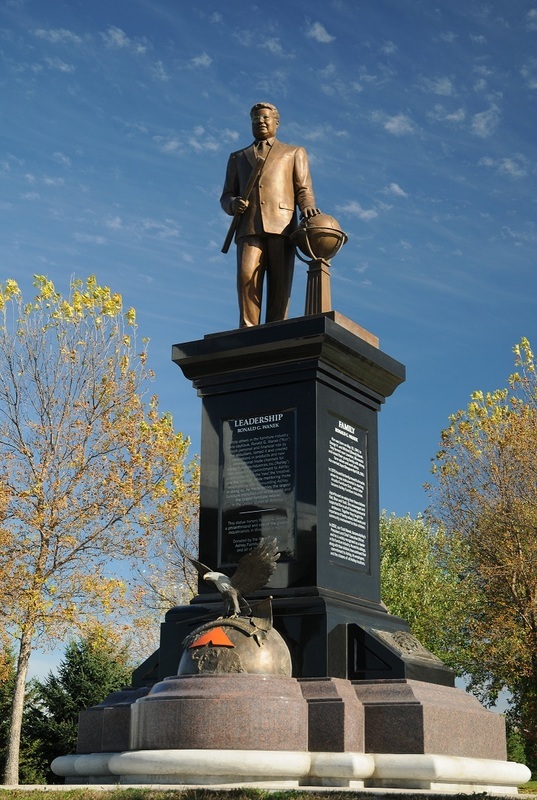 The statue honors Ron, as his friends call him, to celebrate his 50th anniversary in the manufacturing business, for his philanthropy and as one of the greatest industrialists in Wisconsin's history. Ron was born in Winona Minnesota on May 19, 1941. A son of a tenant farmer Ron grew up in a household with no electricity and he didn't have the luxury of indoor plumbing until he was 12 years old. Ron moved many times throughout his career; living in Winona, Mn, Utica, Mn, Altura, Mn and Redwing Minnesota before moving to Arcadia Wisconsin in 1970. Ron worked on his Dad's farms for many years before taking a job as a laborer at Winona industries and later on at Red Wing Industries, a subsidiary company of Winona Industries These companies designed and built wooden stereo and television cabinets. Ron's hard work and his manufacturing innovations were quickly recognized and he was promoted to shop foreman and eventually to superintendent. Ron was very successful in his current career giving credit to 4 great mentors that taught him every aspect of manufacturing over his 9-year career there. Even though he was successful in his early career, Ron had a larger vision, when it came to designing and building furniture, and he was on a mission to create and run "The best furniture company", a vision and mission that holds true today as Ashley Furniture Industries corporate vision: We want to be the best furniture company". It all began in 1970 when Ron and a group of investors leased a vacant building in Arcadia, Wisconsin. At the time of this lease, Arcadia had gone through some very bad times. There were several plant closures... resulting in the loss of a couple hundred jobs, and housing values plummeted all over Arcadia. Some employees had their employment checks bounce and unemployment was rampant; overall the community was not in good shape. Ron knew he could help to reverse the economic situation Arcadia was experiencing and by August 17th 1970, six weeks after he leased this building, Ron's new company, Arcadia Furniture Company started production. By the end of the year, Ron had the plant breaking even, including the repayment of all start-up costs and all employees and vendors were paid on-time, which was a major boost to the depressed Arcadia economy. In 1972, Ron and his investors purchased the building. Arcadia Furniture Company continued to grow and expand its product line, but Ron had a much larger vision and mission to grow his company and to accomplish this, he knew he needed a stronger sales and distribution strategy.